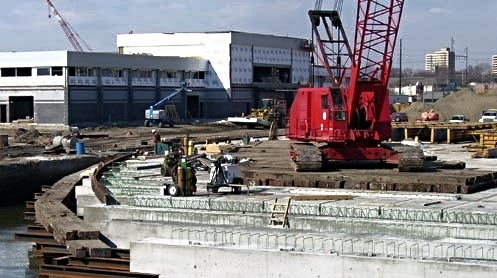 Commerce Construction was chosen, through a joint venture with Buckley and Company, to construct a relieving platform over an existing shipway for the Harrah's Casino and Racetrack. The purpose of the project was to link the racetrack over an existing body of water. The project consisted of many different job tasks related to marine construction and land-based foundation work. The largest components of the job were the demolition of the existing seawall, the construction of two abutments, the installation of over 400 pipe piles, the drilling of various rock anchors, and the construction of a pre-cast/cast deck and walls. Commerce completed the job on schedule, which was critical to the opening of the facility on time. Commerce and Buckley completed the project safely, on time, and within budget.